Real progress is not measured by our efforts but by the shared progress for others. Work out loud to better understand progress. We all obsess about progress. Our organisations obsess about our progress too. Status meetings, reports, dashboards, emails and more are full of progress. How can we need more? With all this attention, how can it feel like many days grind? 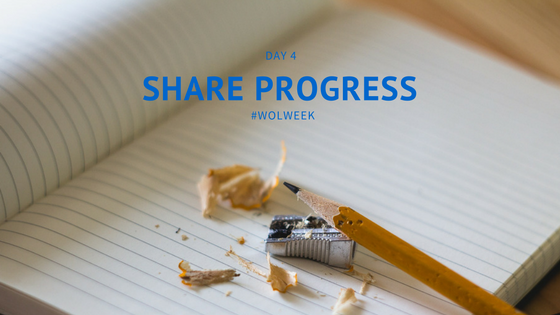 Working out loud asks us to share our work in progress with others. This sharing is not a report. It is the beginning of a conversation. That conversation is what turns Working Out Loud from another management practice to tool of personal effectiveness. Much of our measurement of progress is centred in our work. We measure action, not outcome. We measure progress to our plan and our goal, not the needs of our stakeholders and community. Sharing progress in a way that starts a conversation remedies this. Rich purposeful conversations about progress with those engaged in your work is a critical source of feedback and learning. We cannot be effective in fulfilling our potential and purpose without the guidance of others. Progress alone is no progress at all. Don’t share progress to tell. Share progress to listen. Take 5 minutes today and start a meaningful conversation about progress with your community.